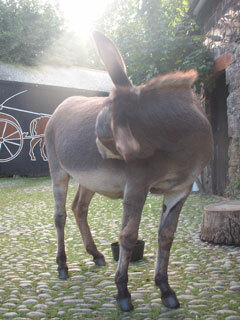 Sinead is one of our big donkeys and our Irish donkey. 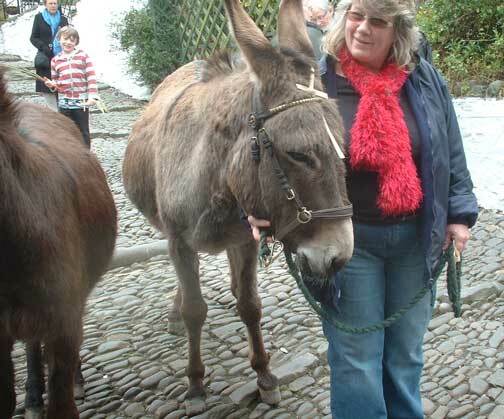 She came to Clovelly just before Christmas 2007 from Northern Ireland. 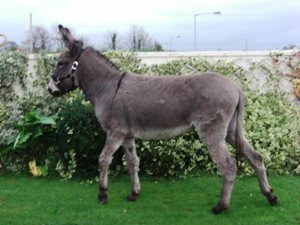 As befits an Irish donkey her name is Irish and is pronounced "Shin-ade". In English it would be Jean or Jane. 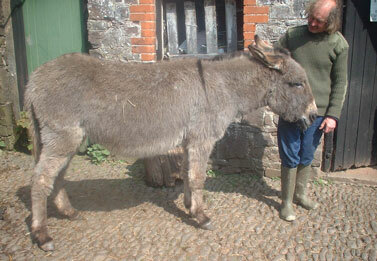 She is 12hh (48" or 1.2m at the shoulder) so she is bigger than the average English donkey. 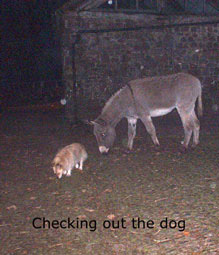 We bought her to breed with our French stallions, Samson and Pierre, who are even bigger than she is. 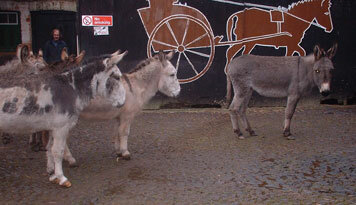 Then we shall have some donkeys big enough to carry children who are too heavy for our smaller donkeys. 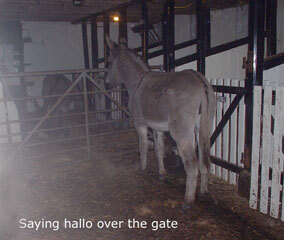 Here is JakeyTed saying "Hallo" to Sinead on the day after she arrived. 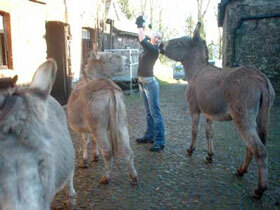 Sinead is very calm and friendly but likes to get her own way. She often stands in our way and doesn't move when you push her. She knows she is big and strong ! Sinead arrived on a dull winter's day. By the time we got home dusk was falling. 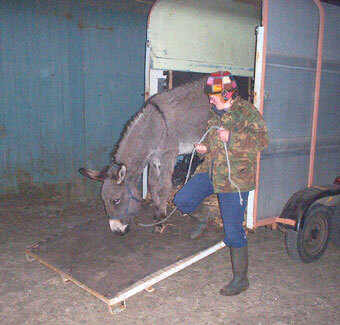 Here she comes out of the trailer. 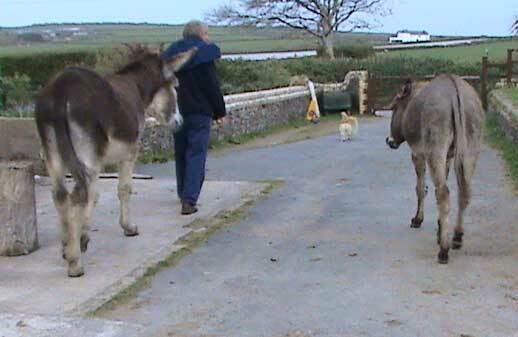 We let her meet a few of the donkeys at a time. Sinead took it all in her stride. She has a very sweet nature, loves attention and is very friendly. 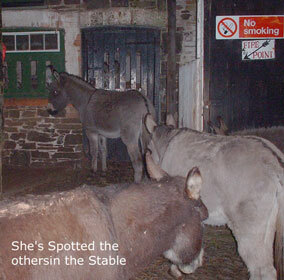 However in real lady donkey style, despite having been here only a few weeks she is already the boss over all the geldings ! 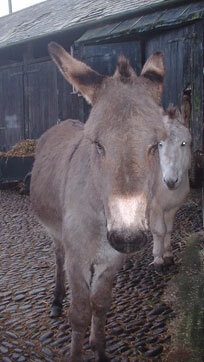 donkey Toby with Charlie in the background. 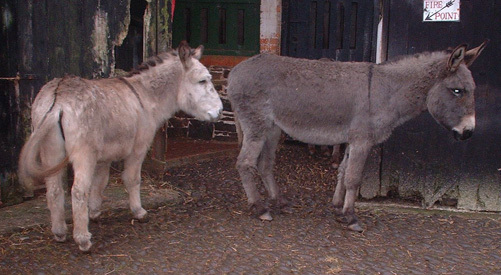 She is much bigger than Toby but the same colour. She stands with him, eats with him and waits for him.We are really pleased because Toby's own friend, Noah, happily goes off without him. 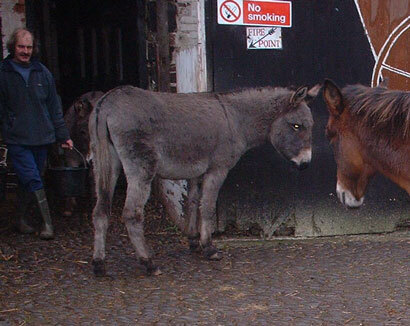 When Sinead had her first foal she turned Toby away and we think that is partly why Toby became ill and nearly died. 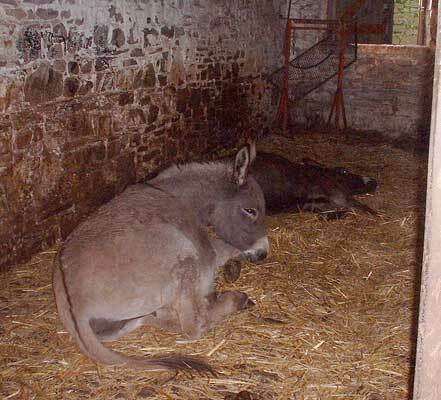 As the foal grew up she accepted him back and he has made a steady recovery - and he is still allowed to share Sinead's hay which is something only her foal is allowed to do . 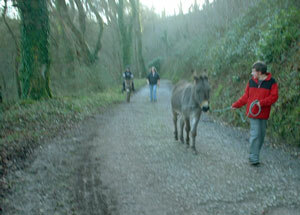 Sinead is ready to go out for her first walk with the donkey riders. 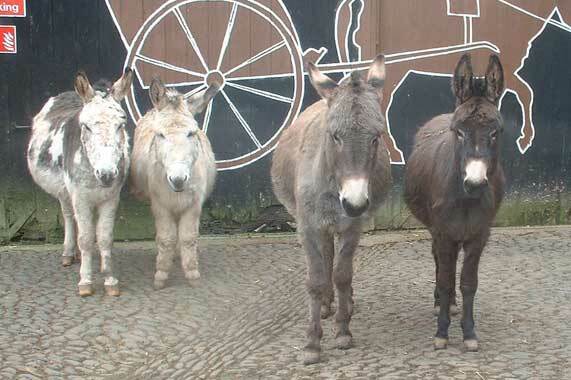 Giffy, Oscar, Donk and Remus the mule are going too. Here we are in the Hobby Drive. Sinead likes to go at her own pace - which is not too fast. and being tall she gets further than the others ! Click here for Baby Kiwi's page. 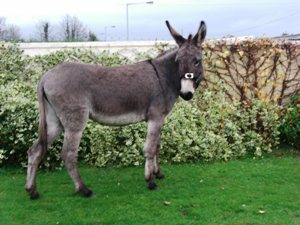 She will be called Kiwi as it is an old Clovelly Donkey name and she looks just like our very dear old Kiwi who died in the winter of 2006. She will be Kiwi the third ! 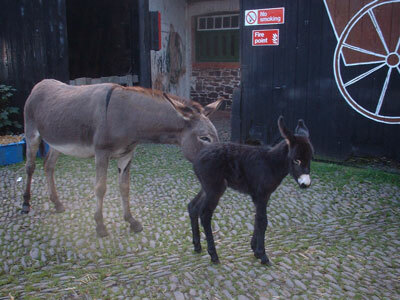 She is the first foal born in Clovelly for over 30 years. 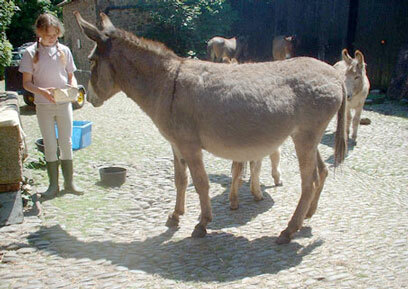 No, we didn't know Sinead was pregnant ! Maybe we should have guessed........... What a surprise ! 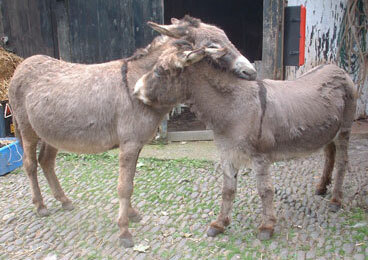 Here is Sinead in May having a nice ear-rub from Bart. 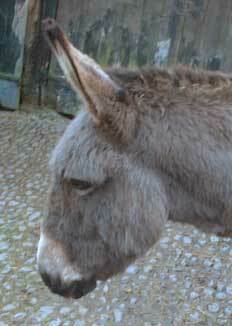 Kissing with Toby in June - the tummy is getting fatter - is it due to eating lots of new grass? 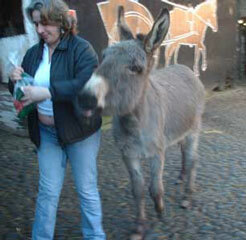 Here's Sinead and Kiwi at 1 year old . 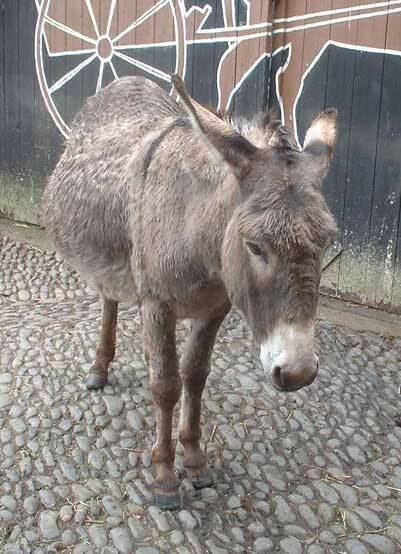 That's Donk with the stripey legs. 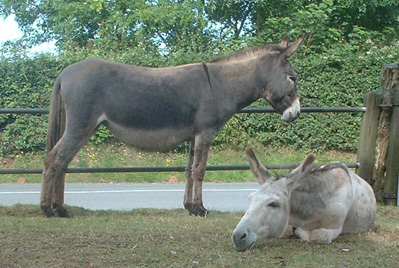 In June Sinead made a visit to our handsome French stallion Pierre. At first she made rude faces at him but she soon decided she liked him. 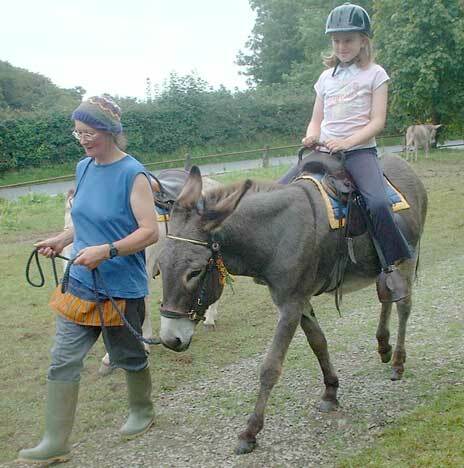 In August Sinead gave her first Donkey Rides around our riding meadow. 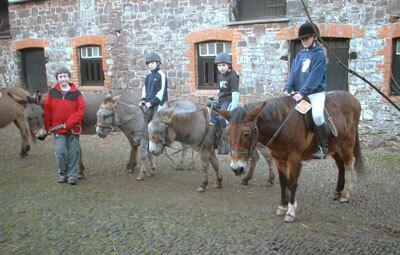 Here is her first rider - her grandad lives in Clovelly and she helps with the donkeys in the summer holidays. 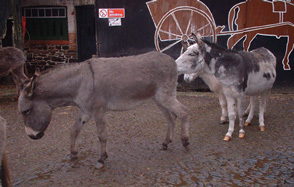 Sinead walks fast and is easy to lead so we think she likes doing donkey rides.Charlie is another fast donkey and he likes to go round with Sinead. 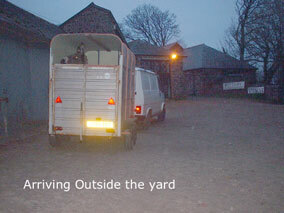 However she won't be giving rides for another year because next year she will be looking after her new foal. Kiwi is much bigger now ! 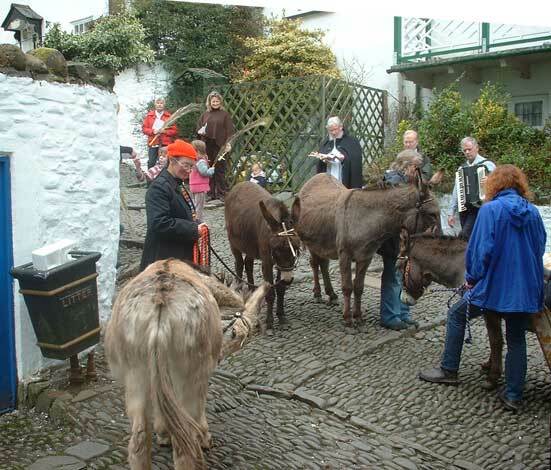 Sinead, Kiwi, Jake and Toby with humans singing hymns in Clovelly village. 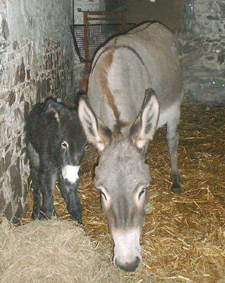 And on the 21st she has a new foal ! 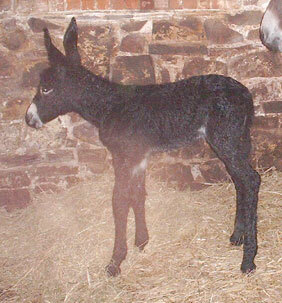 He is a handsome, black, frizzy little chap with very long ears and long legs - he's going to be a big chap ! 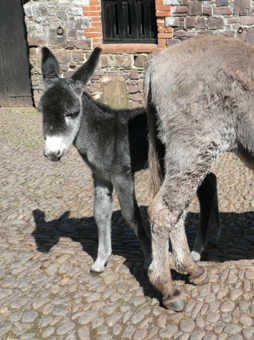 He will be called Peter because his father is Pierre which is French for Peter and because it's an old Clovelly donkey name. 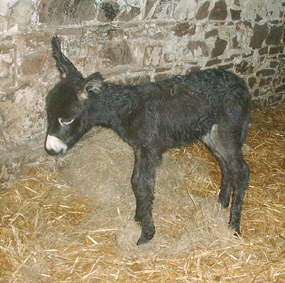 Click here for Baby Peter's page. Well done again Sinead ! 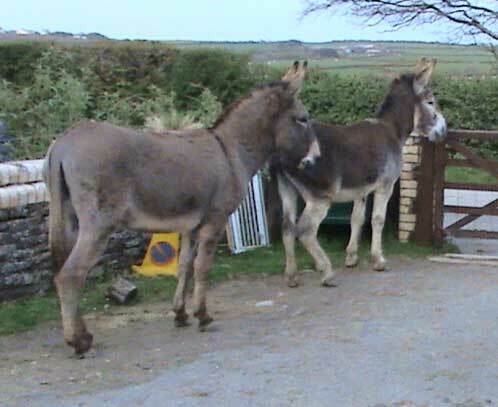 And Then Sinead went to visit Pierre's friend Samson. 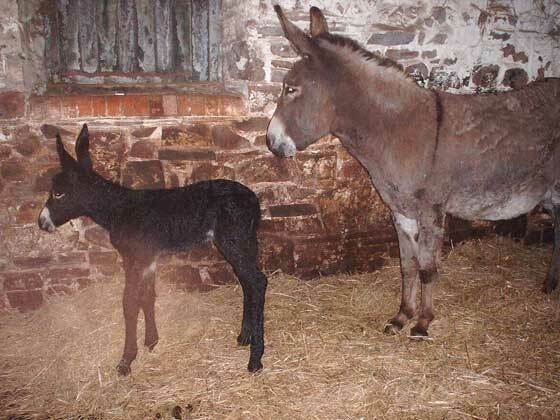 And on Easter Monday Sarah was born ! Well done Again Sinead !! Click here for Baby Sarah's page. A BIG "Thank You ! " to all our Adopters. 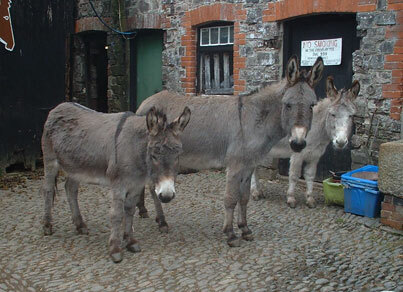 We hope you will all be able to come and visit us too.